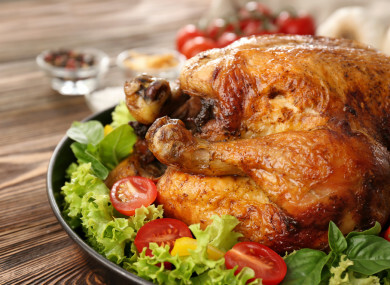 CONSUMERS COULD BE eating “dirty” chlorinated turkeys at Christmas if the UK agrees on a post-Brexit trade deal with the US, according to a new briefing paper by leading food policy experts. The team found US poultry – washed in up to four chemical disinfectants – does not meet EU safety standards. The academics from the University of Sussex also found the chemicals are used in the US to wash fruit, vegetables and fish. They warn that British shoppers would be safer if the UK kept European Union standards and said future controls should be “stricter, not weaker”. Current UK and EU standards were compared with those in the US, and professors Erik Millstone and Tim Lang concluded that the use of chemical disinfectants by the US food industry posed risks to consumers and workers in the industry. “The UK should continue to insist on improving hygiene standards in poultry farms, slaughterhouses and meat-cutting plants and not allow standards to decline, nor try relying on chemical disinfectants to reduce the harm that filthy meat can cause,” Millstone said. The question of whether the UK would import chlorine-washed meat after Brexit was raised when the US Commerce Secretary Wilbur Ross warned that a post-Brexit UK-US trade deal would require that the UK abandoned EU standards. The turkeys and chickens on sale in the UK this Christmas cannot lawfully be washed with four chemicals that the US poultry trade calls “pathogen reduction treatment” (PRTs). The briefing paper identifies the set of scientific and policy documents, endorsed by the US Food and Drug Administration, which explain why the country’s poultry industry uses these chemicals, and why they are not permitted in the UK or EU. The animal carcasses are washed with disinfectants in the US because when they arrive at abattoirs and meat-cutting plants they are far more contaminated with infectious filth, including excrement, than in the UK’s current food supply chain, according to the authors. The UK and EU approach insists that hygiene standards in the supply chain are sufficiently high that they don’t need to be chemically disinfected. Professor Tim Lang said: “We cannot support any weakening of UK food hygiene standards, this is not what UK consumers have voted for or been consulted on. The academics cite a World Health Organisation and UN Food and Agricultural Organisation report saying disinfectants “must not be used to mask poor hygienic practices”. It recommends that public health, environment, animal welfare and consumer organisations combine to prevent the sale of poultry, fish, fruit and vegetables washed with chemical disinfectants in the UK. Email “Your Christmas turkey could be chemical-filled if UK agrees on post-Brexit trade deal”. Feedback on “Your Christmas turkey could be chemical-filled if UK agrees on post-Brexit trade deal”.